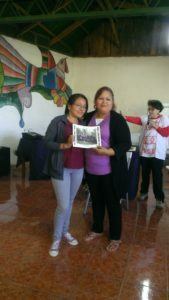 It was a temperate November day when ESPERA women began gathering at the La Palma Hotel in the mountains of El Salvador. Forty-four women arrived in buses and vans from across El Salvador, Nicaragua and Honduras. Almost all left children behind with spouses or family; many were leaving their rural communities for the first time. The women spent three days together exploring the steps they could take to improve three key areas of their lives – self-care, family relationships, and access to resources to grow their businesses. This was the first workshop sponsored by Mary’s Pence focused specifically on emotional and mental health. Through close relationships with the women developed over nearly 10 years of the ESPERA program, we know that emotional health and self-esteem is an important issue to address. Many ESPERA women either directly experienced or are the children of war including The Sandanista Revolution (Nicaragua, 1974-1979), The Contra Wars (Nicaragua, 1979-1990) and the Salvadoran Civil War (El Salvador, 1979-1992). Additionally, a strong culture of machismo leads to domestic abuse. More than a quarter of women in El Salvador, Nicaragua and Honduras report experiencing intimate partner violence in their lifetimes, and approximately 10% report being abused within the last year. 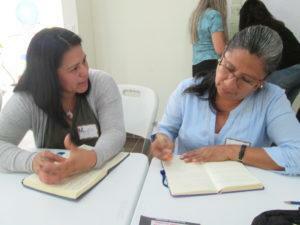 Mary’s Pence hired psychologist Rosa Margarita O’Farrill Domínguez to facilitate the workshop. 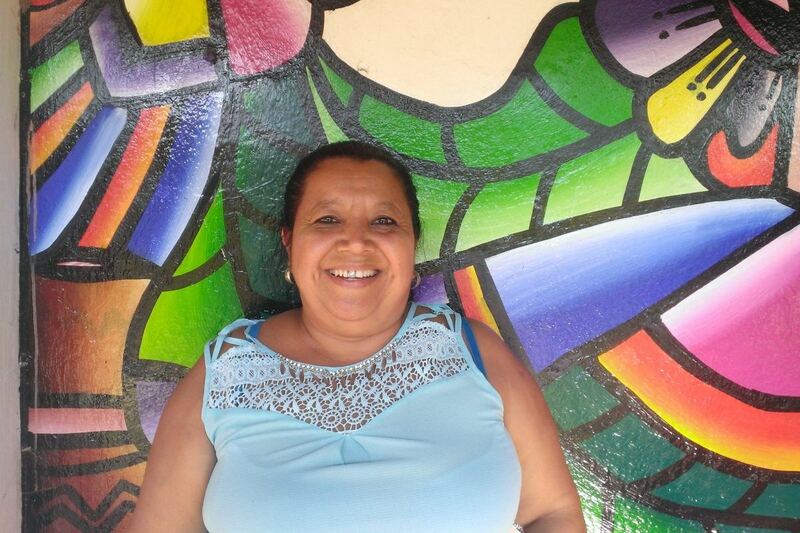 She is a Mexican woman who has lived in El Salvador for many years. During their time together, the women had the opportunity to talk about their experiences in small and large groups. For many it was the first time they had spoken about what they suffered. They shared about violence experienced in their homes and communities, controlling husbands, lacking freedom and voice, childhood abuse by family members, the affects of unhealthy eating, feeling like a slave to their families, and the burden of debt. Through this sharing, they learned that they had many experiences in common. Having broken the cultural norm of silence, in this beautiful setting in the mountains, healing began to take place. Margarita also facilitated a discussion on the ways they could continue to heal. The women discussed the value of sharing their feelings with their partners and families, and also acknowledged that for some, there might come a time when they need to leave their spouses. They also spoke about the importance of paying attention to their own needs including taking time for themselves, and of breaking the cycle of negative thinking about themselves. They affirmed the power of earning their own money, spending money locally, and of saving. There were also moments of pure joy. Women made new friends, laughed over meals, and shared in hours of dancing and singing on the last evening. At the end of the weekend each woman proudly accepted a certificate symbolic of all she had learned. Based on the feedback from the workshops, Mary’s Pence is continuing our partnership with Margarita and we have two offerings in the works. A follow up workshop will be held in September for the same participants. Mary’s Pence will again support women to travel to La Palma, El Salvador for a weekend. At this workshop the women will explore how they used what they learned and how that affected their lives. They will also learn and practice new techniques to heal past and current traumas and create a path forward. 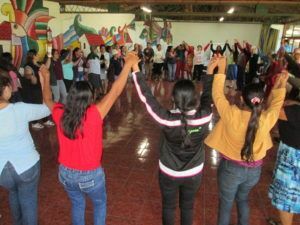 Additionally, Mary’s Pence will support 10 half-day workshops for leaders and participants from our three ESPERA partner organizations in El Salvador. Starting in April, the participants will attend a monthly workshop that focuses on one or two skills. Each month they will also share how they were able to us the exercises learned the previous month. The participants will receive a workbook to remind them of the exercises they learn, and a trainer’s guide so they can lead workshops when they go home and begin to equip other women in their communities with these important skills. We are just beginning this journey of support for mental and emotional health in the ESPERA program. Yet ESPERA women have already begun to bravely confront past traumas and daily stress. Most importantly they’ve created communities of support to walk alongside one another as they begin to heal. Former board member Karen Hurley also attended the mental health workshop in La Palma. Read her reflection on the experience.